In a major revelation that may be just the tip of the iceberg, the Panjab University authorities have come across a racket of bogus detailed marks certificates (DMCs) in the university. Setting a perfect example of bravery, a jogger nabbed a person who fled from the premises of the Sector 34 police station after jumping from the police truck in which he had been brought to the police station along with his two accomplices early this morning. In a hair-raising incident, Haryana Governor Jagannath Pahadia and his wife Shanti Pahadia had a miraculous escape at the Mansa Devi temple when a 3.5-foot-long snake was found in the golf cart from which the duo had just stepped out after using it to pay obeisance at the shrine. In yet another incident of lifting of bags and purses from wedding venues, miscreants today targeted a policeman’s family during a function at SS Farms on the Kharar-Landran road. 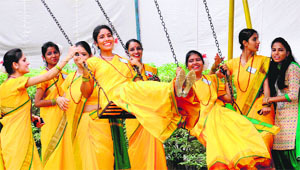 From special effects to sound and light mixing, the organising committees of Ramlilas are putting a lot of effort to stage their popular scenes, including wounded Sarupnakha and “Lanka Dehan”. With the sale of wooden bows and arrows increasing in the city ahead of Dasehra, doctors in the city cautioned against injuries, especially in the eyes, among children resulting into permanent damage to eyes. 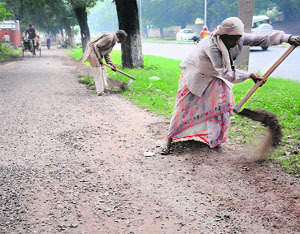 When it comes to implementing orders of the Supreme Court and its own notification in connection with increasing age limit (which is 25 years in Chandigarh) for entering government service in the city, the UT Administration implements only those parts which suits it. Despite a major slump in real estate sector, the Greater Mohali Area Development Authority (GMADA) managed to earn Rs 40.27 crore by auctioning three residential and two commercial sites at its complex, here today. With regular complaints of theft of shoes removed outside ICUs, the PGIMER is now going to install CCTV cameras outside the ICUs and corridors in patient wards in the second phase of the project. While the MC is all set to spend public money on study tours for Gujarat, Hyderabad and even on foreign countries like Israel and Nepal, the BSP has written a complaint to UT Administrator Shivraj V Patil to stop the misuse of public money on such wasteful tours. Rift in the city Congress unit, especially before Congress’s Chandigarh unit in charge and party general secretary Shakeel Ahmed, has come as a major boost for the city unit of the BJP. 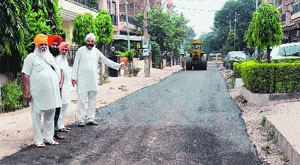 Residents of Phase XI here have complained that the Municipal Corporation is not providing a seal coat on certain roads which are being given a premix carpet. A memorandum of understanding (MoU) was signed between the Uttar Haryana Bijli Vitran Nigam and Bureau of Energy Efficiency (BEE) for the net zero energy building pilot project here today. The memorandum has been signed for the planned building of the Nigam to be constructed at Sector 14, Panchkula. After a gap of around four years, the post of the UT Assistant Excise and Taxation Commissioner has been reverted back to the UT-cadre office. RC Bhalla, senior most UT officer, has been posted as the new AETC. The office of the engineering wing of the Chandigarh Industrial and Tourism Corporation (CITCO), housed in a showroom at Sector 7 was vacated following the order of a local court. In a drive against illegal plying of autos, the State Transport Authority (STA) today impounded 24 diesel autos under various offences. Chandigarh: Members of the Chandigarh Sikh Sangathan on Sunday met Pawan Kumar Bansal, MP and former Union Minister, to thank him for the recently introduced Nangal Dam- Anadpur Sahib-Chandigarh-Hazur Sahib (Nanded) Express. 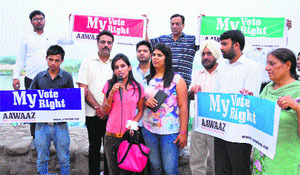 The delegation was led by sangathan chairman Naib Singh. Among others who were there in the delegation included general secretary Harjit Singh, vice-chairman Tara Singh, general secretary of Sector 19 D Singh Sabha Gurudwara, Paramjit Singh and secretary of Sector 40 Gurudwara, JS Kahlon. For the first time, the UT Education Department is collecting the school enrolment data relating to children belonging to all minority communities staying in Chandigarh. The literary festival of Chandigarh Literary Society (CLS) to be held from November 23 to 24 at Lake Club, Chandigarh, is expecting to bring prominent literary names to the city. Over 300 persons participated in Chandigarh ‘treasure trail’ organised by the Chandigarh Tourism and the Chandigarh College of Architecture on the occasion of 125th birth anniversary of Le Corbusier yesterday. The 15th annual conference of the Skull Base Surgery Society of India was organised at the PGIMER on October 5 and 6. It was inaugurated by Prof VM Katoch, Director-General, Indian Council of Medical Research. Panjab University Youth and Heritage Festival (Zone B) commenced at Guru Gobind Singh College for Women, Sector 26. Education Minister of Haryana Geeta Bhukkal was the chief guest and Prof Arun Kumar Grover, Vice-Chancellor, Panjab University, was the guest of honour on the occasion. The minister in her address felicitated the students and wished them success in their future endeavours. Gurukul Global School, Manimajra, in association with the District Rotract 3080 on Monday received a delegation of 20 environmentalists from Australia, Germany, Zimbabwe, Brazil and Italy. The Orchid Eco Club of the school showcased their activities through a power point presentation. 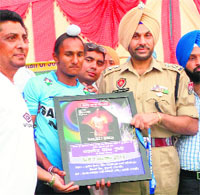 A three-day Punjabi University Ropar-Zone Youth Festival began at Government College today. 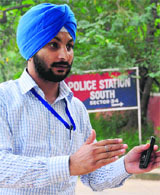 Teams from 29 colleges affiliated to the Punjabi University, Patiala, participated in various competitions. The Regional Institute of Management and Technology (RIMT), Mandi Gobindgarh, organised a seminar on “Financial Planning for Youth”. Condolence meetings were held today at Guru Granth Sahib World University, Baba Banda Singh Bahadur Engineering College and Mata Gujri College, Fatehgarh Sahib, for Tejinderpal Singh, son of Jathedar Avtar Singh Makkar, President of the SGPC,. Fifty-two units of blood were collected at a blood donation camp at the Primary Health Centre of Amrali block today. Nearly two months after the re-auction of a vehicle registration number by the Chandigarh Administration came under judicial scanner, the Punjab and Haryana High Court today directed its allocation to the original successful bidder. Its re-auction was stayed by the High Court in August. 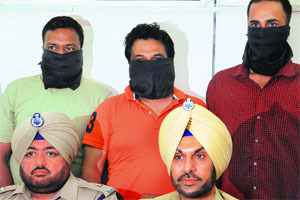 The Mohali police has arrested three persons in connection with a case of kidnapping in an Audi car on October 3 while three other accused in the case are still at large. Three Class IV employees of the PGIMER were arrested for stealing around 350 X-ray and MRI films and reports from the Department of Radiotherapy at the PGI on Monday. Two motorcycle-borne miscreants snatched chain of a 45-year-old woman at Phase IV, here today. The Chandigarh police has registered a case of theft and trespassing against unidentified accused who stole one buffalo, a cow and a calf from the Cattle Pound, Industrial Area, Phase I. The police said the theft of animals took place on the intervening night of October 5 and 6. The case has been registered at the Industrial Area police station, and an investigation has been initiated. 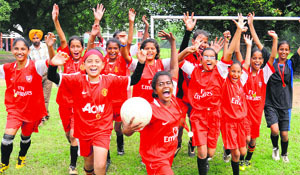 Retaining the title, girls of Government Model Senior Secondary School, Sector 22, lifted the title of inter-school football championship for girls (U-14), for the third time, here today. In the final match of the championship, the team defeated Ryan International, Sector 49, by 4-0. For past two years, the UT sports department has failed to fill the vacant seats of state run Chandigarh Football Academy. The reason may differ but as per official record all the selected players were found either overage or declared medically unfit by the panel of doctors. And, without any discussion on the medical results the department closes down the case. While the report of the GMSH-16 says Arshdeep has refractive disorder, the PGI report (right) says he has a perfect eyesight. For 17-year-old Harjeet Singh Tuli, it was just like a dream come true when he was brought in decorated open jeep at a function, especially organised to honour him, at Kurali this evening. A fine 157-runs contribution by Nikhil Chaudhary helped the Punjab side to muster 351-runs in 96.3 overs against West Bengal’s team during the third round league match of the 3rd All-India invitational cricket tournament for Dhruv Pandove Trophy of boys (U-19), today. Local tennis player Muskan defeated Prince Panchal in straight sets during the girls (U-12) category match of ongoing CLTA-AITA Super Series Tennis Tournament, being held here today. In other matches of same category, Prinkle Singh beat Bhakti Shah by 6-1 and 6-1 while Dhriti Kapoor defeated Anjum Shaik Mushrath by 6-1, 6-4. Priyanka Jakhar also registered a 6-3 and 6-2 victory over Yana Dhamija. The cricket team of Sigma XI registered a 15-runs victory over FCI cricket team, during the ongoing 4th AG Corporate T-20 cricket tournament. The All India Carrom Federation has invited four local players to attend the selection trails for the junior Indian Carrom team (under-19). 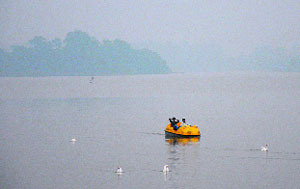 Mohd. Talib, Mohd. Hassan, Tuba Sehar and Manu Gupta will represent Chandigarh in the selection trails to be held at Vadodara (Gujarat) on October 11 and 12.